Each host and service entry has a configuration tab that indicates what hosts have been delegated management control over that host or service. Open the Identity tab, and select the Hosts or Services subtab. Click the name of the host or service that you are going to grant delegated management to. Click the Hosts subtab on the far right of the host/service entry. This is the tab which lists hosts which can manage the selected host/service. Click the Add link at the top of the list. 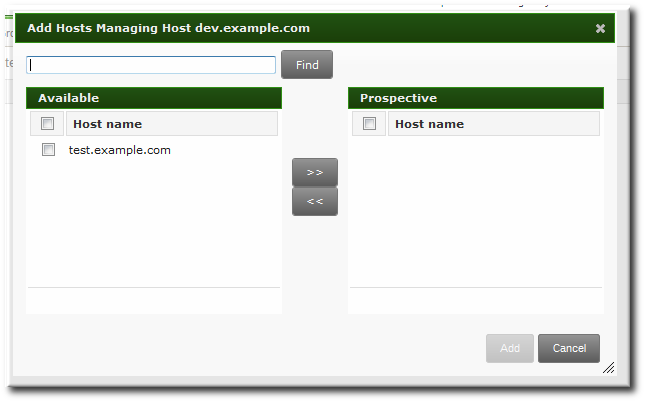 Click the checkbox by the names of the hosts to which to delegate management for the host/service. Click the right arrows button, >>, to move the hosts to the selection box. Click the Add button to close the selection box and to save the delegation settings.